Derwent’s new Inktense Pan Paints are a nice addition to the Inktense line. They have all the great characteristics of the pencils and blocks and have a travel edition that is nicely portable. Here are a few of the techniques and tips I use with them. 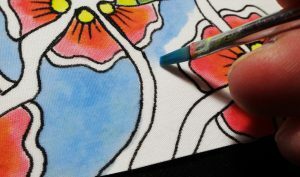 In my previous blog on ‘Taking Inktense Off the Page… Working on Fabric’, https://blog.derwentart.com/2017/02/17/taking-inktense-off-the-page-working-on-fabric , I specifically focused on using Inktense pencils on fabric. I enjoy creating wearable/functional art and the Inktense line is my favourite media for putting transparent colour permanently on fabric. While in this article I focus again on fabric, many of the tips and techniques apply to watercolour paper as well. To begin with, just a reminder that you are using an ink media, so protect your work surface and clothes. One other thing, I will use the words ‘bleeding’ and ‘running’ interchangeably to refer to the tendency of water media to expand quickly into fabric. Let’s look at the equipment needed. 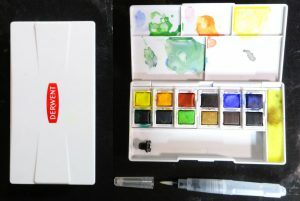 Brushes – On Paper: If you are using the Inktense on Watercolour paper, then watercolour techniques and brushes apply. I particularly like using water brushes with this medium on paper. On Fabric : The key to controlling liquid media on fabric is the brushes you use. Fabric wicks up moisture and bleeding occurs very easily because of its ability to absorb and conduct moisture. To avoid bleeding, one needs to use the least amount of moisture possible to avoid colour bleeding. Therefore, brushes that hold little moisture are needed when applying the media to fabric. I use good quality brushes to start with. I use large round soft brushes only to wet the paints and mix a solution of colour. Once the colour is mixed, I switch brushes. To apply the colour to the fabric, I use either 1) flat brushes, 2) watercolour scrubber brushes or 3) very thin, stiff round brushes. These brushes generally have shorter bristles and don’t hold a lot of water. You will need to reload the brush more often, but the bleeding will be much less. 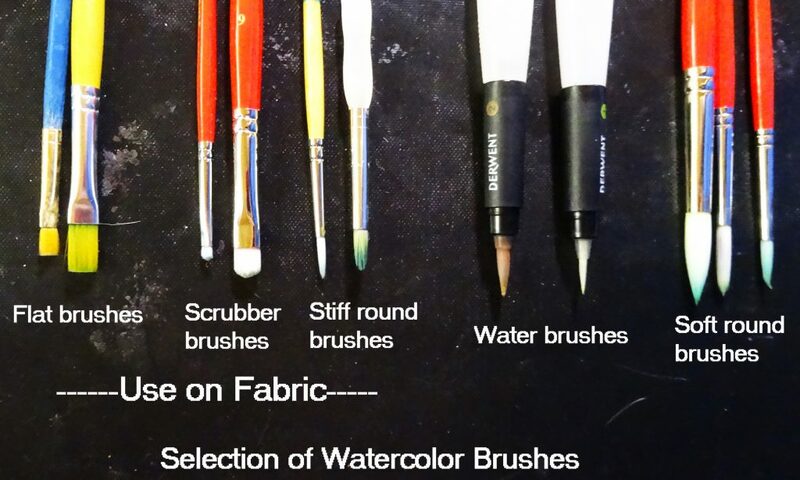 If I am using fabric as a substrate, I do not use water brushes. You know, they are the cool brushes with hollow handles. I love them, but they have a tendency to deliver too much water when you’re not expecting it and you want control on fabric. Palette You will need a palette of some sort to mix an amount of colour to work with. 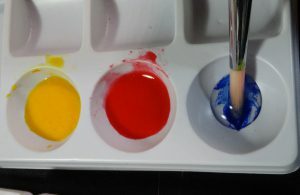 I use the palette to make an amount of liquid colour to either paint or mix. Taking the colour right from the pan and applying it to the fabric gives very intense colour and it is touchy since if you work the colour on the fabric much with the brush, it can cause bleeding. I would suggest doing most of your colour mixing on the palette, unless bleeding is the effect that you want. You can’t work the media on fabric like you can on watercolour paper. Water containers– I suggest using two small water containers when you work with this media. Watercolour artists do this all the time. One container is for the clean water you’ll be adding to your work, one is to clean off your brush in order to load it with the next colour. Cloth or Paper Towel– I like having some absorbent cloth or paper towel nearby to touch the moisture off my brush if I have too much on it. This can be critical also in controlling bleed on the fabric or on watercolour paper. AND you can use it as a texturing tool by using it to coax off some of the colour you’ve already applied to the substrate, be it paper or fabric. Fabric– If you are using fabric as a substrate, I suggest natural fibres. Be aware the finer the fabric, the more and faster the absorption and bleed. Canvas has thicker fibres and is often a twill weave, which is tighter with the fibres packed closer. This can cause canvas to be more resistant to water absorption and bleed. Broadcloth, quilters’ cotton and/or silk are thinner in regular weave, allowing for faster absorption and bleed. Be aware of the type of fabric you are using and test on a scrap piece or in a place where you can’t see so you know how your media reacts with the fabric. 100% natural fibre is best for colour permanence. Stabilise the fabric– If you are working on fabric, it helps immensely to stabilise the fabric. It also adds just a tad of resistance to bleeding. I do that in one of two ways. 1) iron freezer paper on the back of the fabric or 2) use a temporary spray fabric adhesive to adhere the fabric to foam core or plastic. Paper– If you are using paper, all watercolour techniques apply and I suggest using a decent quality watercolour paper that is at least 140 Lb. There are a lot of different qualities of watercolour paper and I don’t want to name drop because certain manufacturers paper may not be available everywhere. I tend to use a good medium quality watercolour paper. The cheapest paper is usually just that. You want a watercolour paper that the water will stay where you put it, will absorb without bleeding, and the surface will stand up to working the colour a bit and not pill or ripple excessively. To avoid the rippling of the paper so the colour pools when water is applied, I use a painter’s tape to tape all edges of the watercolour paper to a piece of foam core when I work on paper. Therefore I have several different sized pieces of foam core laying around the studio. Before applying the tape to the edge of the paper, I stick the tape lightly to my clothes to remove a little of the tackiness. I’ve had the tape rip the upper paper layer before when I remove it, and taking away a little of the tackiness helps. Fabric medium– In order to control the Inktense paint on fabric, I add a little fabric/textile medium. There are many of them from different manufacturers and I use different ones for different purposes in my multi-media artwork. For this I need a medium that is not glossy, sticky or pearlised. There are a number of them that will work, but I find that textile mediums by Americana, Delta Ceramacoat, Folk Art, and Golden’s GAC-900 work well. The addition of a few drops of the textile medium increases the viscosity and surface tension of the paint, resisting the bleeding tendency of the liquid paint into the fabric. You will need to experiment a little as to the amount of medium to use to reduce/eliminate bleeding. Below is an example of Inktense paint with and without textile medium painted on fabric. Colour Selection – Most paintings are not done with all available colours. Artists choose a more limited set of colours for any particular work. Some have their favourite colours that they work with all the time. Audition and mix the colours you want to use on scrap pieces of paper or fabric. Setup and making stock colour – After setting up your workspace, wet the pan paints with enough water to make a shiny little puddle of water on top of the pan paints you will be using. I usually use a large round brush to add clean water to the top of the pan. While the paint is softening, add some water to each of the palette cups in which you will be mixing paint. I seldom use more than a teaspoon or so of water. I prefer to mix only what I’m going to use in a session. However, if your paint does dry out, if it hasn’t been mixed with textile/fabric medium, you can just add water to make it liquid again. This is true also if you are using Inktense blocks for your colour source. 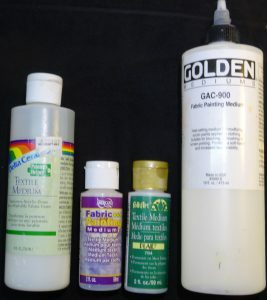 If fabric medium has been added, adding water to the dried mixture will generally not reconstitute the paint properly. 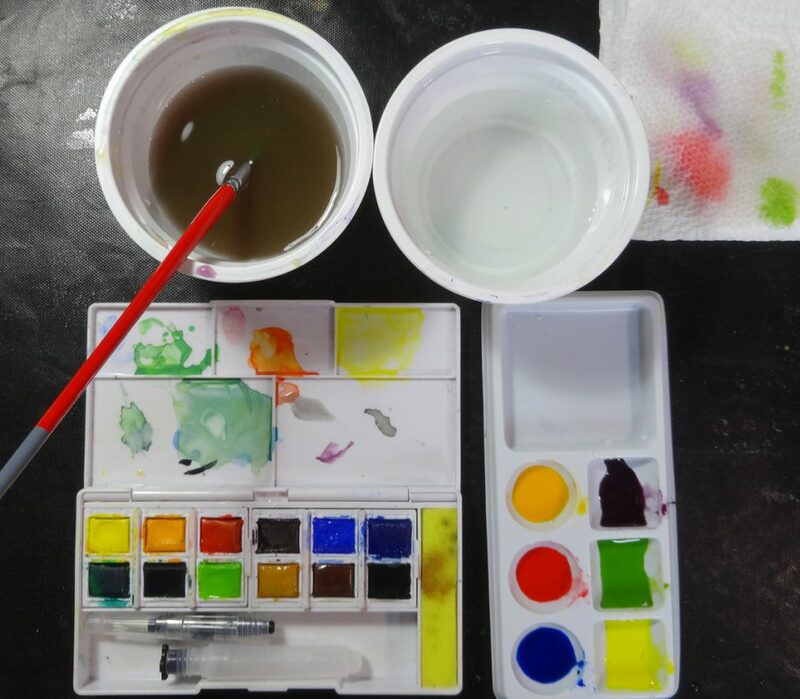 Mixing Paint– Place a small amount of clean water in the palette cup, dip a large round brush into the softened paint in its pan and discharge the colour into the water. I often use 2-4 brushfuls of paint to make the paint solution when I’m making an intense colour. The intensity of the paint depends on how much of the pigment you put in the water. Repeat until the colour is what you want. At this point if you are working on paper, fly, be free, experiment and have fun. If you are working on fabric, add a few drops of the textile medium and mix well. Changing to a brush that does not hold a lot of moisture, try out the paint on some scrap fabric to see if it bleeds or not. How to start- It’s sometimes hard to get started. If you don’t know what to draw or paint, find one of the new black and white prints that lend themselves well to colouring with paints. 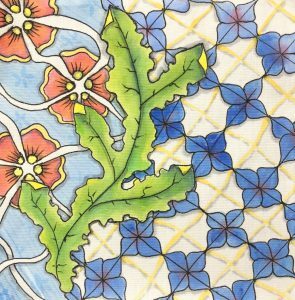 I’ll often draw freehand or some of the patterns I have learned and teach as a Certified Zentangle® Teacher and then use the paints to colour them in on fabric or wearables, like a colouring book. Or I’ll draw with pencil on the substrate, if I don’t want the drawing to show, like in classic watercolour painting. If you refer back to my blog from February 2017, you will find my recommendations of fabric markers/pens that are permanent and don’t bleed. Application Techniques – Wet on wet or dry – I’ve written before about wet or dry techniques. With this medium, you only have the option of wet medium onto a dry or wet surface. If you want control and placement of paint, use wet on dry. Wet on wet is very uncontrollable on fabric as it bleeds even more than on paper. But it can create some really cool effects. So look at a watercolour book and try some things. Glazing – or over-laying. Because this medium is permanent when dry, you get some really cool depth to colour layering when you let the previous layer dry and then work further. Mixing colours by glazing is subtly different than mixing the paint colours wet and applying it. Finishing- when you are done with your fabric painting, let the piece dry and heat set with an iron according to the instructions on the textile medium. Thank you for the patience and consideration for getting to the end of this longer than I intended article, but I’m a technical girl and I want to make sure you have the techniques and tips to succeed using the Derwent Inktense Pan Set. And thank you to Derwent for giving artists a forum for bringing information to you.